Organizations’ need for real-time data has increased significantly. According to Ventana Research, 46% of organizations said they consider processing events in seconds or sub-seconds to be essential to their organization. However, Ventana also revealed that many organizations also did not feel ready to deal with real-time data. Only 31% said that they are fully satisfied with their ability to capture and correlate events today. 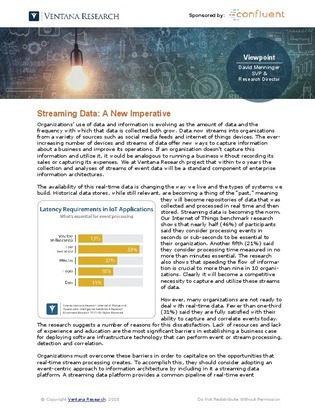 Read this white paper for more information on how to stream data in real time properly so that your organization can react to and respond to opportunities as they arise in the market and gain an edge on your competition.